AD113. Hand stamped chipboard wallet, hand stamped disc. Made as orders come in. Unlike other Arachnidiscs Recordings releases, this album is not numbered as we don’t know how many we’ll be making. While rehearsing for live dates in Winter of 2013 and Spring of 2014, BABEL (Jakob Rehlinger) recorded over 11 hours of prepared guitar improvisations (direct to 2-track stereo). In a feat of endurance, he distilled those hours down to one 79 minute album, ZWERM (“Swarm”). Those familiar with BABEL’s Heurter and Rillingen albums will know what to expect from these solo guitar explorations—percussive, almost industrial rhythms blended with harmonic drones and sparse, lyrical melody lines. Added to the existing recipe are elements of spoken-word cassette collages which were sampled and mixed live into the throbbing hum. Additionally, we’re offering an extremely limited edition 48-track USB called TOTAAL which contains 11 hours and three minutes of material from the complete sessions plus two concert recordings. The ZWERM album is included in its final 6-track form, 8 additional takes on the theme, along with six other collections titled MAELSTROM (‘Sturm’ variations), OVIS (electric sheep), VERWORFEN (discarded segments collaged together), THANATOPHOBIK (ghost voices and the fear of death) and VÅR (live performances in Spring). 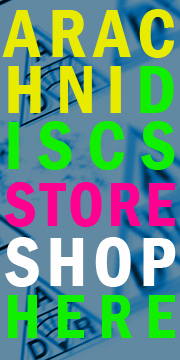 You are currently browsing the ARACHNIDISCS RECORDINGS blog archives for November, 2014.